Very few things are more frightening than watching a small baby struggle to breathe. What is just a common cold to an adult can be a major threat for some small babies. RSV, or respiratory syncytial virus, is the most important respiratory infection of early childhood. The virus lives inside the cells lining the respiratory system, causing swelling of this lining coupled with the production of large amounts of excess mucus. In adults, this shows up as a bad, lingering cold with thick nasal congestion and a deep, productive cough. In infants, however, the excess mucus can be enough to plug their small airways or bronchioles, resulting in a severe illness that requires hospitalization. RSV is the most significant cause of bronchiolitis and pneumonia in babies and young children. Almost all children have had RSV by the time they are two years old. Children who first get it under 6 months of age (or who have serious underlying illnesses) are at the highest risk for severe disease. Thankfully, severe RSV infection is very uncommon in the first 6 weeks of life, because these babies still have antibodies from their mothers. RSV occurs throughout the world, and in each location, it tends to occur in yearly winter outbreaks. In the northern hemisphere, the peak of the epidemic is usually in January, February, or March, although in some years it may begin earlier and/or end later. Although most babies have mild illness, almost 125,000 infants are sick enough to be hospitalized with RSV each year in the United States. Typically, a parent, or more likely an older sibling, comes down with a bad cold first. He or she exposes the baby to the virus. The time from exposure to illness is usually about 4 days, give or take a few. Then the infant typically develops a runny nose and a red throat. Over the next 3 days or so, the infant gets sicker. Symptoms might include cough, wheezing, and sometimes a fever or an ear infection. In most infants, this is as severe as RSV gets. Some, though, will get progressively sicker with fast respirations (>60 per minute), difficulty breathing, and listlessness. About 3 percent of infected infants get sick enough to require hospitalization. The specific symptoms will depend on the specific child and on the parts of the respiratory tract infected (croup, bronchitis, bronchiolitis, pneumonia, etc.). In very young babies, less than a month old, the only symptoms might be poor feeding, irritability, or perhaps lethargy. RSV is very contagious. The disease spreads when infected droplets in the air or on the hands encounter someone else’s mouth or nose. It has never been shown to be passed from someone standing as far as 6 feet away. It can remain on the hands for half an hour, and on fomites for hours. The disease usually lasts 5 to 12 days. Most who are hospitalized are well enough to go home within a few days. A simple blood test may predict which children are most likely to go on and develop asthma. Several studies have shown that children with RSV bronchiolitis who had a high eosinophil count at the time of the illness had a higher chance of persistent wheezing and of developing asthma. (Pediatrics 2000; 105 (1): 79 -83). While RSV and asthma certainly go together, even with severe RSV and a high eosinophil count, there is a good chance of avoiding asthma altogether. It is not known whether the virus damages the respiratory system thereby causing the asthma, or if people’s susceptibility to asthma predisposes them to severe RSV. I suspect that it is a little of both. Rapid RSV tests are available, and are done using nasal swabs. There are no specific medicines for treating RSV at home. It is important to give plenty of fluids to prevent dehydration. Also, a humidifier or saline nose drops might be recommended to thin the mucus. Steroids and antibiotics are not usually helpful. If possible, protect your baby from exposure to sick individuals during the peak RSV season. In addition, good hand washing, particularly just before anyone handles susceptible infants, can decrease spread. Use a tissue when you cough or sneeze! 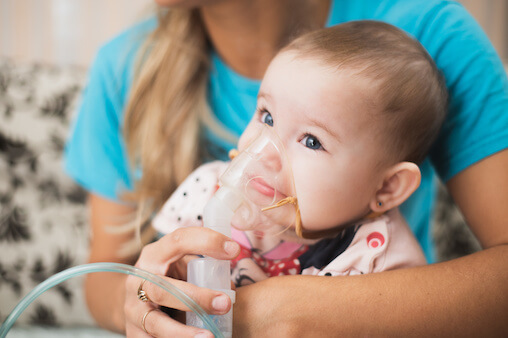 Two products are now available to prevent RSV infection in children at high risk for serious disease (e.g., infants with a history of prematurity, cardiac defects, and lung disease). RSV-IGIV (RespiGam) and palivizumab (Synagis) have been approved for high-risk children.